Pearls of Juggling – The book, Workshops and more. Free 29 page Taster of the Book! Il libro Pearls of Juggling anche in Italiano! Click here to download 29 pages of Pearls! And receive rare and spontaneous emails on new articles, workshops and more." Pearls of Juggling took me just about 5 years to complete. It was a long creative process. Inspired by the book “The Zen of Juggling” by Dave Finnigan I started to hold creative residential workshops for jugglers. Combining Yoga, physical theatre and ideas I was starting to forge on juggling practise. The first of these workshops was held in the year 2000, in Fossa near Aquila that was unfortunately heavily damaged by the earthquakes in 2009. Between 2003 and 2006 my quest took me to study physical theatre at the renowned Dimitri School in Switzerland. I had learned to juggle in the UK in 1994 and started a daily yoga practise in 1998 under the guidance of Yoga master Mario Verri at the Purna Yoga Center in Rome. Pearls of Juggling is a book that expresses in a simple and clear way the results of my work with jugglers, my idea is to inspire and suggest rather than lay out rules. A book to inspire all jugglers – professionals and beginners, teachers, circus performers and the curious. For anyone who always wanted to know how the masters handle the fundamental questions in juggling, such as how to: Move and express yourself while having more fun with juggling? Build a fully-realised training regimen that’s tailored to your needs? Find your own authentic style and create original performances and shows? Reduce drops and use them to your advantage? You’ll find the answers to these questions, and many more, within the pages of this book! 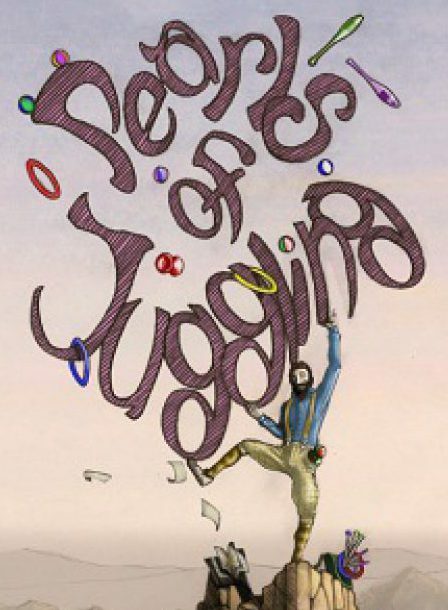 After four years of research and reflection, twenty-one years of juggling, seventeen years of yoga and three years in the Dimitri Physical Theatre School in Switzerland, Anthony Trahair has put his experience to good use in this book of Juggling Pearls! 30+ custom colour illustrations from the students of the Scuola Internazionale di Comics in Rome to inspire your creative juices! This book is not always so easy to get a copy of. Please check with your local juggling or book store first. Pearls is now also available in the UK with Amazon Prime.